After reading about all the latest advances in 3D technology and seeing several 3D movies in the theater I could resist no longer. My wife said I had an obsession! After months of research I finally pulled the trigger and bought a 3D TV. One of my chief complaints about in-store demos is they always showed you 3D formatted content but never what the conversion of regular 2D programs to 3D looks like. Reading online reviews hardly mentioned the quality of 2D to 3D conversion that is built into many 3D TVs. The manufacturers did this as a way to sell more 3D TVs because of the current lack of 3D programming. With this in mind I decided to start small and bought a 32" Toshiba (model 32TL515U) for our bedroom, just in case I would not be happy with the 2D to 3D conversion. Walmart.com had dropped the online price for the 32 Toshiba 3D TV to under $500 and offered free site to store shipping. List price initially had been $1000 but Toshiba's website (http://us.toshiba.com/tv/3d/32tl515u) had now dropped it to $850 since it is a 2011 model. One of my favorite websites which I check daily is DealNews.com. I learned from them several years ago that the best time to by a new brand name TV is in the December-January time frame. This is because the new models are usually introduced at the Consumer Electronics Show in early January and manufacturers are trying to clear their prior years inventory plus the Super Bowl is about to take place which creates buzz for buying a new TV. 2 - The reviews online are very good. I make it a practice to read as many customer reviews as possible before I buy. Amazon.com usually has the most reviews and since the TV was functionally identical for all screen sizes I had many more reviews to read in doing my evaluation. 3 - I definitely wanted the 2D to 3D conversion due to the current lack of 3D programming. Some manufacturers do not offer this in the smaller screen sizes. 4 - I definitely wanted a set with passive 3D glasses. I have read too many complains online about the active shutter glasses having ghosting & flicker, being uncomfortable to wear- causing headaches & eye fatigue, needing recharging, being expensive, etc. Go to 3D TV Display Technology Shoot-Out (http://www.displaymate.com/3D_TV_ShootOut_1.htm) for an excellent comparison review of active shutter 3D glasses versus passive 3D glasses. It appears to me that active shutter glasses may fall by the wayside. 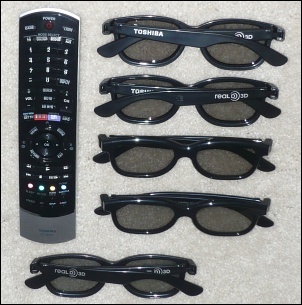 Toshiba has announced that all their 2012 3D TV models will use passive glasses. I understand that Westinghouse and Sanyo have joined Toshiba, LG, and Vizio in using the passive technology. Getting back to my purchase, I picked up the TV 5 days ahead of when Walmart initially said it would be ready for pickup. Walmarts free site to store shipping service was excellent. I highly recommend it. After a minimal amount of time assembling the stand on to the display panel, connecting the Bright House Cable DVR, and turning on the TV (actually takes approximately 25 seconds to boot up), I was extremely impressed! The 2D picture is outstanding and the 3D picture blows me away! The 2D to 3D conversion is much better than I expected. This set converts anything 2D to 3D on any input. The on-the-fly 2D to 3D conversion is amazing. 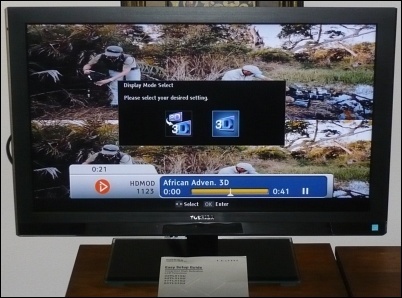 I can now watch any 2D TV program (480i, 720p, or 1080i) in 3D. I'm not a big sports fan, but I sat there and watched some hockey and football and could not believe how much better it looked in 3D. I played the Blu-ray disc 2D version of the movie Avatar and tried the 2D to 3D conversion on both the TV and my Panasonic 3D Blu-ray Player. The Toshiba TV offers 5 depth settings for 3D and the Blu-ray Player offers 8. Both did a fantastic job of conversion. I almost felt like I was watching the 3D version of the Blu-ray disc. I tried some of our Family Newsreels from 1994 that I had burned on to DVD. (Gee I looked young and had black hair then!) It just amazes me how the TV turns everything into 3D. I hooked up my old Canon mini DV tape Camcorder via the TV's composite input (using one of two supplied AV adapter cables) and played back our last vacation converted into 3D. I also tried the Bright House Cable DVR's component output into the TV's component input (using a supplied component adapter cable). That worked beautifully converting to 3D. Toshiba has thought things out quite well. This Toshiba TV has 2 USB inputs in addition to it's 4 HDMI inputs so I put in a 8GB flash drive. From the flash drive I could play movies, JPEG photos, and MP3 music with the TV's built-in media player. The best part is it will convert the movies and JPEGs into impressive 3D. How impressive depends to some extent on the resolution of the source material. Obviously a 1080p video has more data to input into the conversion process and will therefore render a much better looking conversion. For movies, playability depends somewhat on what encoding codec was used in the recording process. The TV would not play MOV files downloaded from my several year old Panasonic digital camera (said it was an unsupported format). But it would play other MOV files and WMV files depending on what codec was used to record them. This is where a computer audio/video format conversion program comes in handy. For example it played the SCPCUG 2011 Holiday Party WMV format video recorded with the latest codec (WMV3) but not the same video recorded with an earlier codec (WMV2 or WMV1). It played some MP4 videos I had recently converted from other formats. Also, I was surprised to find it played 2 DivX movies in AVI format out of a list of 6 I had on a flash drive. I will have to do more research to figure out exactly what codecs it is supporting. The specs in the manual indicate for video on the USB input it recognizes MPEG2, MPEG4, and H.264. I just love the fact that I can now watch all this content in 3D. I next watched several free 3D formatted movies and the 2012 Rose Parade on a Bright House Cable HD On Demand channel. That 3D was excellent, just like a 3D movie in a movie theater. 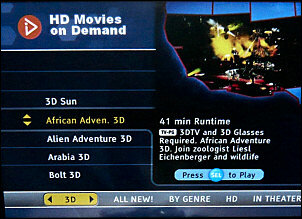 One 3D formatted video "African Adventure" from the On Demand Channel had outstanding 3D. It felt like I was right in the boat with the people cruzing down the river and the weeds hitting me in the face. That seems to be the big difference between original 3D content and 2D to 3D converted content. The original 3D gives you a feeling of actually being in the scene whereas with the converted content you are looking at a scene which has depth. It is like looking through a window--you see the depth and the picture looks very realistic, but nothing is coming out of the screen making you feel like you are part of the scene. It should be noted that obviously original 3D content will always look better and more realistic than the converted content but the converted 2D to 3D content sure beats plain old 2D! This Toshiba TV comes with 4 pairs of passive 3D glasses. For all practical purposes these glasses are identical both physically and functionally to those you get in a movie theater. The only difference is the theater glasses say RealD 3D on both sides of the frames whereas the Toshiba glasses say RealD 3D on one side and Toshiba on the other side. We already had 3 pairs from the movie theater so we are now well equipped for a family viewing. The glasses allow for a wide horizontal viewing angle while maintaining the 3D effect so we could easily accommodate 7 viewers at once. The vertical viewing angle, however, is more critical and on the 32" model it is approximately 16 degrees (26 degrees on the larger screens), 8 degrees above and 8 degrees below the center of the screen. The manual warns you to sit with your eyes at the same height as the center of the screen for ideal viewing. If you exceed the vertical angle you begin to see a double image with the 3D glasses on. So TV viewing height has to be taken into account when picking a location to place your TV. Many of the reviews I have read online complain about the sound quality of today's TVs. This is understandable as the TVs are getting smaller and more compact which does not allow for large quality built-in speakers. The answer of course is to connect to an external receiver or amplifier sound system. Here in lies the problem. Not sure if it is an effort by the industry to get consumers to buy new receivers with HDMI support for 3D, but it appears many of today's TVs have only an optical digital output for sound besides the sound fed through the HDMI cable. So if you have an older receiver with only RCA type analog sound input jacks you may be out of luck. Luckily, this Toshiba TV has a mini fixed audio output jack that connects with a supplied AV adapter cable to a standard analog audio cable allowing connection to RCA type analog sound input jacks. Strangely, the manual has a graphic displaying the TV's back panel that shows this fixed audio out but does not mention it anywhere else. I was not sure if this jack actually worked until I connected to it and experienced wonderful surround sound from my old Pioneer receiver. This Toshiba TV also connects to the Internet like most TVs now-a-days. It will download the latest firmware and has Yahoo Widgets and Net TV (CinemaNow, Netflix, Vudu, Blockbuster, etc.). I like the fact that it has both wired and wireless capability built-in. Some other TVs want you to buy an expensive wireless adapter. The TV manufacturers make a big deal about today's TVs being able to connect to the Internet but the downside which is not mentioned is it is very clumsy and time consuming trying to navigate with a remote control. To me it is much easier to hook up my Windows 7 Acer laptop via an HDMI cable to the TV and navigate with my mouse, not to mention I can surf the entire Internet instead of relying on Widgets that provide only specific functions (Yahoo! Weather, Yahoo! Finance, Yahoo! News , etc.) or sites (Flickr, YouTube, Twitter, Facebook, etc.). Also the laptop allows me to play many more movie formats because I have several movie players installed with the appropriate codecs. It was a joy to see my Windows desktop in 3D for the first time. Finally a word about HDMI cables. Some of the big box stores hype the need for buying expensive HDMI cables when you buy a new TV. 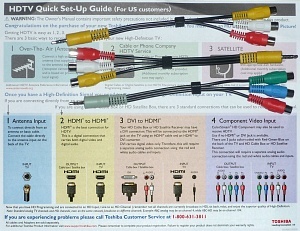 The story is you need the latest high speed cables that support 3D or your new 3D TV may not display properly. In fact the Toshiba manual even has such a warning. That being said you do not need to spend a fortune for HDMI cables. I have a 25 ft high speed HDMI cable (normally used for connecting my laptop to the 52 Sharp Aquos 2D HDTV in the living room. I purchased this cable online during a sale from Meritline.com for under $10 with free shipping. I'm sure shorter 6 ft high speed cables would cost even less. In checking out this 3D TV I did some extensive testing (hours) by connecting the 25 ft cable between the TV and (in turn) the laptop, cable DVR, and 3D Blu-ray player. I had no problem with passing 2D or 3D content to the TV through this high speed HDMI cable. So don't buy the hype that you need expensive cables. Note: Web Master Wanderings articles contain links to external web sites. Web addresses are constantly changing. There is no guarantee that the information links provided in this article will remain unbroken or up-to-date beyond the date that this article is originally published.